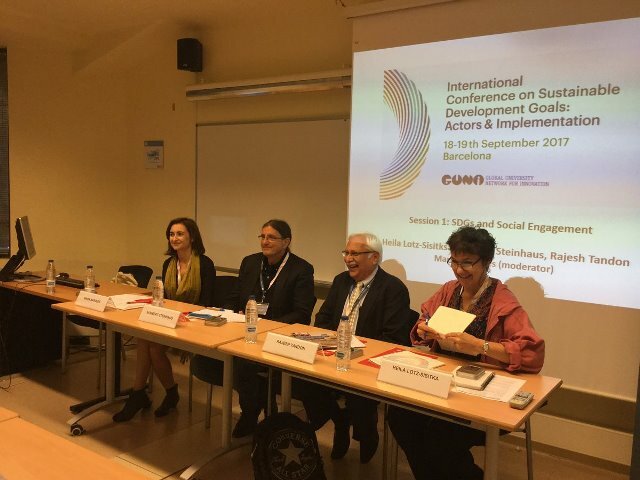 The Global University Network for Innovation (GUNi) hosted the International Conference on Sustainable Development Goals: Actors & Implementation’ on September 18 & 19, 2017. The conference witnessed multidisciplinary experts and high-level practitioners from around the world to exchange knowledge, ideas, experiences and expectations around the challenges involved with the SDGs. Dr Rajesh Tandon, UNESCO Co-Chair participated in the deliberations as a key speaker, where he spoke on ‘Higher Education & SDGs: Making the Commitment’. Here, Dr Tandon reflected on the role of higher education vis-à-vis SDGs, in the broad context of its social responsibilities. He outlined the importance of re-orienting the higher education mission in ways that facilitate the achievement of SDGs. He said that ‘teaching should be viewed as catalysing the learning process, research should be approached as a process of knowledge generation and mobilization and service should be a tool for mutual empowerment’. This involved revising existing curriculum, employing innovative, pedagogical tools, framing locally usable research, building knowledge in partnership and promoting service-learning.